If you've ever held fresh cacao beans or cacao nibs in your hand, you know that the actual bean itself is just as solid as a coffee bean or a pinto bean. 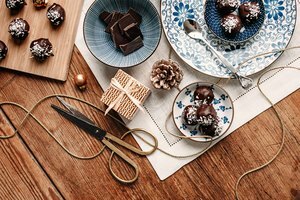 Good chocolate contains just the bean itself and a few other minor ingredients, usually sugar for sweetness and maybe lecithin to help give it a smooth texture. So how does the finished chocolate melt, when it's made from a perfectly solid bean? Chocolate melts as easily as it does for the same reason butter melts: It's mostly made of fat. In the case of good chocolate, that fat comes in the form of cocoa butter. This is the fat that occurs naturally in cacao beans, and it's what gives chocolate that rich, addictive, melt-in-your-mouth texture. 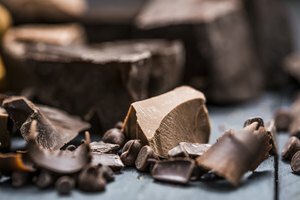 Lower quality chocolates, and especially the "chocolatey" coatings on some candy bars and frozen ice cream treats, might replace some or all of the cocoa butter with lower-cost fats. They all melt just fine, though. By the time chocolate is processed and ready for sale, the solid parts of the bean – the cocoa – are ground so finely that they stay suspended in the fat, like milk solids in the butter at your table. A better question, if you're melting chocolate to make your own, ideally healthier, treats at home, is how to melt your chocolate properly. Chocolate's flavor and texture take a beating at temperatures well below the boiling point of water, so you have to treat it very gently. You already know that chocolate will melt if you hold it in your hand for more than a few moments, so temperatures of just a little over your own body heat are high enough to get the job done. 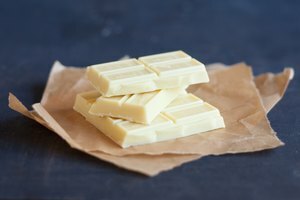 Dark chocolate will melt nicely at a temperature of 114 to 118 degrees Fahrenheit, milk chocolate needs only 105 F to 113 F, and white chocolate will melt at 100 F to 110 F. There are any number of ways to melt the chocolate, but two are especially practical for home use. Even at their lowest settings, the burners on your stove are too hot to melt chocolate safely. The trick is to set a pan of water on the stove first, and then melt your chocolate over the warm water. You don't want to set up the kind of double boiler you'd use for a custard, because that can still get too hot for melting chocolate. Instead, make a water bath in an open pan so you can see the water and keep it at the very lowest simmer you can manage. If your chocolate comes in the form of a bar or block, it helps to chop or grate it into small pieces first and stir it frequently as it melts. The only problem with this method is that getting any water into your chocolate is a really, really bad thing. It'll make your chocolate "seize," which means it will turn into a grainy, solid mass that's just not going to melt again. That doesn't mean you have to throw it out, but it will need to be repurposed. You can still dissolve it into milk to make custards, puddings or sauces, or even just a really good cup of hot chocolate. If the idea of possibly seizing your bowl of chocolate makes you nervous, you might want to try the microwave method instead. Put your chopped or grated chocolate into a microwaveable bowl or measuring cup, and start by warming it for 30 seconds. Give the chocolate a stir, then put it back in the microwave for 10 to 20 seconds at a time, stirring every time you open the door, until the chocolate is mostly melted. You want to still see some lumps in the chocolate, because if you keep going until it's completely melted you'll probably overheat the chocolate. Instead, take it out and just keep stirring. The residual heat in the rest of the chocolate will eventually melt the lumps. The worst thing that could happen is maybe having to remove a stubborn lump of chocolate with a fork, before you go on to use the rest. Just melting the chocolate is all you need to do if it's going into a recipe as a flavoring. If you're going to use it to make candy, there's an extra step called "tempering," which is a whole subject all on its own. The issue is that cocoa butter is a pretty complex fat. If you want your finished chocolate to have the glossy look and hard snap that you see with from the professionals, you have to play with its temperature so that the cocoa butter forms the right kind of crystals as it cools. Otherwise, it stays soft and dull-looking. 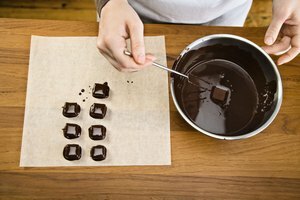 The pros have lots of different methods for tempering chocolate, but the simplest one to use at home is called "seeding." Basically, you'll use chocolate that's already tempered to help force the rest of your chocolate to grow the right kind of structure. 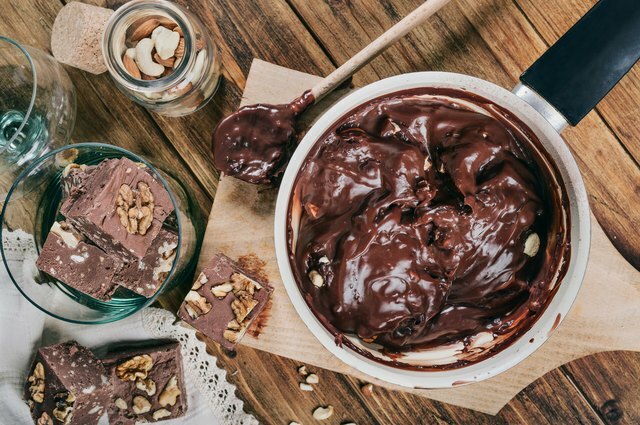 Grate a few tablespoons of chocolate from any good-quality bar – Ghirardelli, Lindt and Valrhona would all work fine – and add them to your melted chocolate after it's had a few minutes to cool. Add dark chocolate to dark chocolate, milk chocolate to milk chocolate, and so on. Stir it in until the new chocolate has also melted, and your bowl of chocolate is somewhere between 84 F and 88 F. At this point, your chocolate should be in temper. You can test it by putting a little dab on a piece of wax paper. If it hardens in a matter of moments, has a nice sheen and breaks when you bend it, you're good to go. If not, re-warm the chocolate by a few degrees and seed it again.